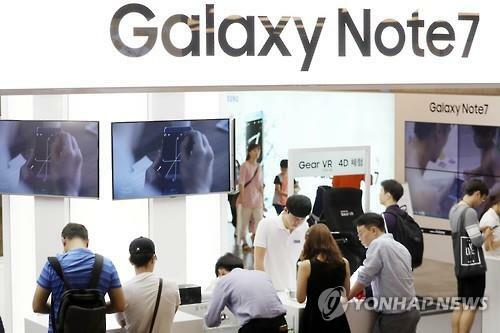 SEOUL, Aug. 8 (Yonhap) — The new Galaxy Note phablet by Samsung Electronics Co. is drawing attention worldwide with its iris-scanning feature that allows a user to unlock the smartphone in the blink of an eye. Samsung unveiled the phablet, the successor to the Note 5, in New York earlier this week in a bid to keep up the momentum of its smartphone sales after widening its lead over Apple Inc. in the global smartphone market this year. The launch of the Galaxy Note 7 came ahead of the latest iPhone launch, expected in the autumn. Following the launch of the new Galaxy Note in New York, Koh Dong-jin, head of Samsung’s mobile division, told reporters that the company expects sales of the Note 7 to surpass those of its predecessors. “The iris-recognition (feature) is not just aimed at unlocking a smartphone,” Koh told reporters. Samsung “is moving with a big roadmap, including a connection to (smartphone) applications,” Koh said. The remarks by Koh were seen as Samsung’s willingness to commercialize iris-recognition features before its rivals do so and take the initiative in developing and selling smartphone featuring heightened security and privacy. “The Galaxy Note 7 combines productivity and entertainment, and strong security features. Powering a robust ecosystem, it is the ideal device for those who want to achieve more in life,” Koh said in a statement. “Life moves faster than ever now so we created the Galaxy Note 7 to move with users helping them get things done more easily wherever, whenever,” Koh said. In the premium smartphone market, Samsung is steadily going from a copycat of Apple to a competitor with its Galaxy lineup. However, the market trend for smartphones is changing. The era of smartphone innovation is fading and Chinese brands such as Huawei and Xiaomi are rapidly catching up with their low-end smartphones. The launch of the Note 7′s iris-recognition feature is viewed as an attempt by Samsung to pioneer the premium smartphone market with an advanced security option. Reviews about the Note 7′s iris scanner by some foreign media outlets were not optimistic. Because the human retina is almost impossible to replicate, some media outlets raised questions about irreparable problems if something goes wrong in the registration process. Other media outlets warned that contact lenses and glasses can cause problems with the iris scanner. Speculation is rising over whether the Note 7′s iris-reading feature would appeal to consumers. In a research note, Hyundai Securities expected Samsung to sell about 12 million Note 7s in the second-half of this year. 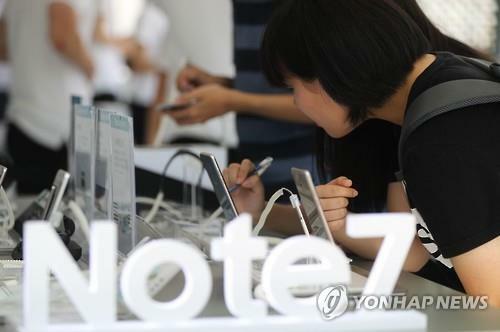 According to an online survey of 9,692 people by Droid Life, an online media specialized in the Android operating system, which is used in Samsung’s smartphone, 58 percent said they have no willingness to buy the Note 7. Twenty-three percent said they were willing to buy the Note 7, while 19 percent have made no decision yet, according to the survey as of 4 p.m. on Thursday. “Competitors will set the tone of their next smartphones, depending on whether the Note 7 is successful or not,” the official said. Since last year, Samsung has been unveiling its high-end Galaxy smartphone series earlier than scheduled to stay ahead of Apple, which eventually boosted its market presence and earnings. Boosted by stronger-than-expected shipments of the Galaxy S7 smartphones, Samsung logged an operating income of 8.14 trillion won (US$7.32 billion) during the second quarter of the year, with its mobile business division racking up an operating income of 4.32 trillion won, up 57 percent from a year earlier. Preorders for the Note 7 in South Korea will begin on Saturday, and Samsung is expected to launch the new phablet locally on Aug. 19. The price for the Note 7 is set at 988,900 won in South Korea.